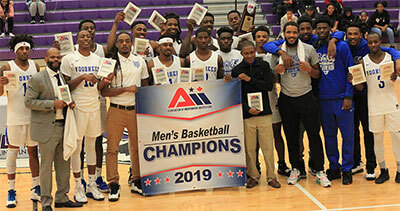 More than 40 minutes was needed to determine the 2019 Association of Independent Institutions men's basketball champion. Voorhees College's Javari Albergottie (6'1''-G) hit a 3-point field goal from the right wing with 1.8 seconds remaining in the second overtime period to give the third-seeded South Carolina-based team a 91-89 victory against No. 4-seed College of the Ozarks (Mo.) Sunday night at Lincoln College in Lincoln, Ill.
Voorhees, College of the Ozarks and third-place winner Washington Adventist University (Md.) will represent the A.I.I. in the 2019 NAIA Division II national tournament. The championship game featured 10 ties and 17 lead changes. Voorhees led 44-36 at halftime, but the College of the Ozarks battled back in the second half by making 40.5 percent of its shots during the 20-minute period to tie the game at 72-72 and force overtime. Both teams managed to score 10 points during the first five-minute extra session. A three-point play from Brandt Cochran (6'0''-PG) gave College of the Ozarks an 87-86 lead with 1:23 remaining. A basket from Denzel Famble (6'5''-F) gave Voorhees an 88-87 advantage with 55 seconds left in the second overtime period. The lead changed two more times the rest of the way as Ethan Davidson made two free throws to give the Bobcats an 89-88 lead with 34 seconds left. That set up Albergottie's heroics. The shot came on the fourth try for Voorhees during the final possession. Alex Books initially missed a shot, then Albergottie attempted a 3-pointer from the right wing before Famble missed from under the basket. The ball got deflected out to Albergottie, who drained the deciding 3-point field goal with 1.8 seconds left. College of the Ozarks was unable to get a shot off before the final buzzer. Brooks led Voorhees with 24 points, while Famble and Albergottie added 22 and 20 points, respectively. Jaylen Hill (6'3''-F) scored 13 points off the bench. Davidson registered a game-high 31 points and Cochran scored 25 points for College of the Ozarks. In the third-place game, No. 2-seed Washington Adventist got 21 points from Charles Vines while Therence Mayimba (6'7''-F-95) had a double-double with 19 points and 11 rebounds in an 88-76 victory over tournament top-seed Indiana University Northwest. Washington Adventist held a 47-39 halftime lead and the margin grew to 13 points, 60-47, following a pair of free throws from Xavier Sewell (6'2''-G) with 15:12 remaining in the game. A basket by Derrick Hopkins gave the Shock a 72-56 lead with 8:56 remaining in the game. Indiana Northwest attempted a comeback as Armon Williams made a 3-point field goal to trim the deficit to nine points, 74-65, with 4:39 left. A pair of free throws from Rashad Richardson brought the RedHawks within 79-71 at the 3:04 mark. However, the team could only get as close as seven points, 81-74, after a basket by Christopher Dixon-Williams (6'0''-PG) with 1:46 left in the game.